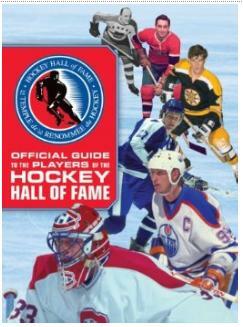 Official Guide to the Players of the Hockey Hall of Fame is one of two new hockey books from the Hockey Hall of Fame for the 2010 season. The others is The Hockey Hall of Fame Book of Goalies. This book definitely surprised me. The Hall of Fame has put out several books about it's honoured members over the years. They tend to be quite similar - beautiful coffee table sized books blessed with photos right out of the Hall of Fame vaults. This new release is almost better categorized as a pocket book. I was almost shocked! After years of bigger books I'm still trying to get used to the new format. First rate book but the typography is ludicrously small and virtually unreadable without a magnifying glass.